N891JF is flying again! It was signed off for flight in late May of 2014, and flown a few days later. It turns 3250 rpm in flight, and has a top speed approaching 170 mph. Not as good as N56ML, but we'll work on that. Stall speed is in the low 50's mph range. There is plenty of warning of the approaching stall, thanks to the turbulent RAF45 airfoil buffeting the tail. The forward-hinging canopy works perfectly, self shutting on engine startup. Here's the first flight...almost 2.5 hours of testing. 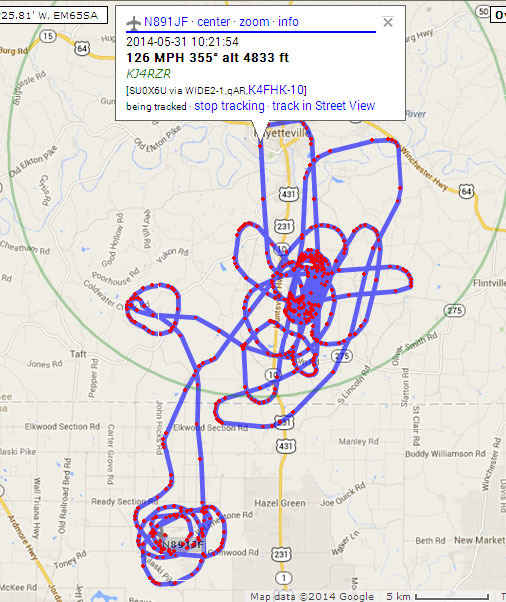 This APRS plot resembles a bumblebee pollinating a flower. In addition to stalls and airspeed indicator calibration, I did twelve landings at FYM to practice coming back to the home airport, which is half the length and less than half the width. The speedbrake certainly helped tame the landings. N891JF is a stock-dimension KR2, originally built in 1991 by Jim Faughn. It's powered by a Great Plains 2180cc engine that Steve Bennett and Jim built 25 years ago. Jim put 308 hours on the airframe over the years, flying it to the Gathering almost every year. I bought it in August of 2102. The plane has an excellent paint job on it, and it's the original done in 1991. One innovation that Jim pioneered for KRs is the "opera windows" in the rear. These are handy when flying formation and looking for other traffic in the pattern. One interesting thing about this airplane is that a few years after completion, Jim and his wife decided to build a big sailboat and cast off on another adventure. They sold almost everything they had, but the KR2 was special. Jim struck up a deal with Steve Bennett that Steve could buy it for a dollar, with the understanding that if/when Jim wanted it back, Jim could buy it back from Steve for TWO dollars, thereby DOUBLING Steve's return on investment! After several years of sailing, Jim settled down in Florida, and he and Steve decided to sell the plane. Since I knew the plane and had flown it at one of the Lake Barkley Gatherings, I bought it. Over the years, Jim did more than his part to spread the word on how cool KRs are. He flew it to the KR Gathering every year, and OSHKOSH at least once. 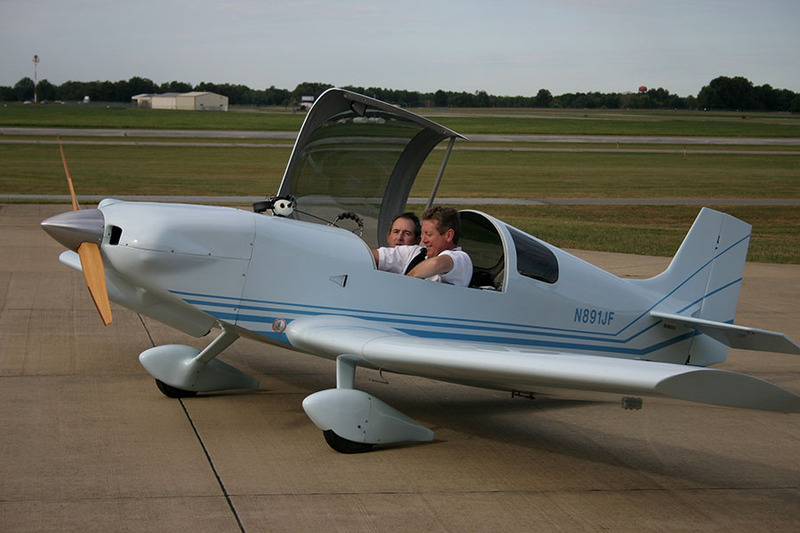 Here he's taking Dan Heath on a "motivational" flight at the KR Gathering in 2004. I got a similar ride in N891JF in 2003 or 2004 as well. It's powered by a 2180cc bored and stroked Type 1 Volkswagen engine, similar to the 2110cc engine I built for my '74 Karmann Ghia back in 1978. It's shown here at one of the KR Gatherings. After I put about 15 hours on the plane, it spun the center main bearing, and the story of the rebuild is at 2180cc VW Engine Rebuild. 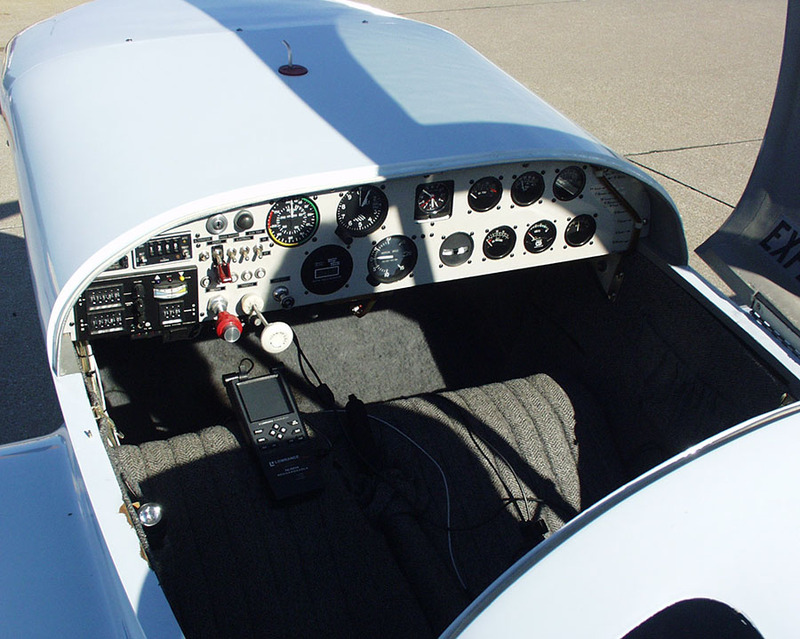 The instrument panel and interior was nicely done, as with the rest of the plane. 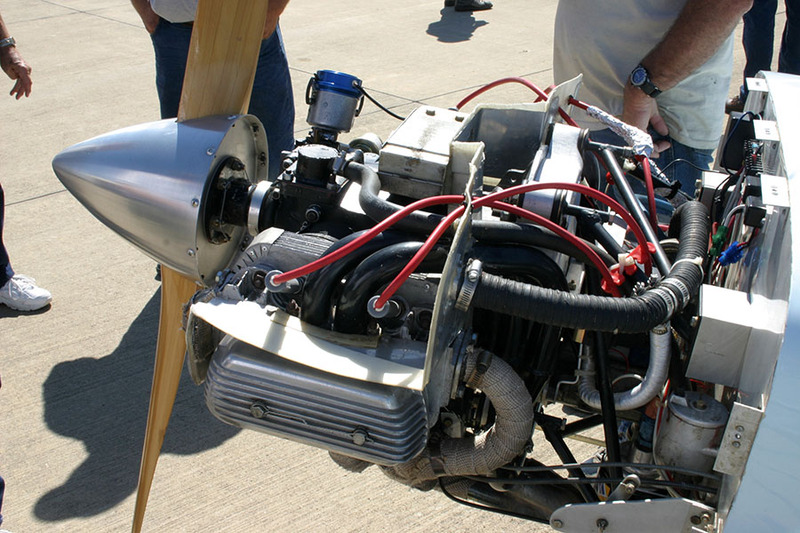 But after the spun bearing affair, which happened at about 1500' eight miles from the nearest airport, I knew there had to be a major update on the panel so I could keep a closer eye on the engine parameters. I tossed all the steam gauges and outfitted it with an MGL iEFIS Explorer, which not only monitors and displays engine information, but records it to a smart card for future reference. I also added an iFly 720. See Instrument Panel Update for more details on that. One thing I noticed before I even flew it was the brakes. One side was pretty lame and the other didn't hold well. I couldn't run the engine up over about 1500 rpm without running around in circles, so clearly the brakes needed some attention. Granted, it had been sitting quite a while, so issues were to be expected. The brake system refurb page has more details. Another improvement was the canopy "re-hinging"...from side-hinged to front-hinged. This was done as a matter of safety, both taxiing and flying, as well as getting better ventilation in the summer. I also changed the method of shoulder harness attachment, was shown in my shoulder belt anchor installation, which decreases the angle of the shoulder belt with respect to my shoulders.